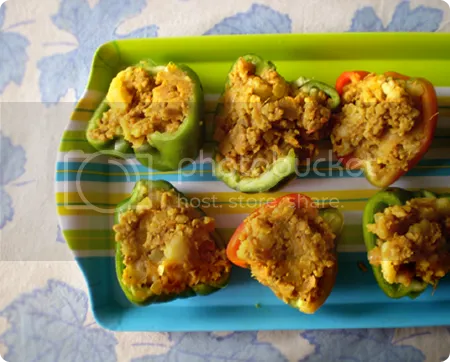 Stuffed peppers or stuffed capsicums as we call them, have always been a family favorite. I remember, as a kid I used to help out my grandmother with all the stuffing. This was not a “regular” preparation though, and were only made when guests were invited. My brother and I would hide outside the kitchen, around the corner waiting for the first batch to come out; when it did, we’d grab one each and run!! We ended up with scalded fingers and tongues of course. Grandma’s recipe asks for fish in a spicy turmeric and tomato sauce. The ones I made yesterday were stuffed with minced meat or more precisely, mutton. Now, mutton’s always usually goat out here, but minced lamb meat does more than well. – red chili powder…I like a lot of this to make the dish super-spicy! Fry the onions in a pan along with the ginger and garlic pastes, until the edges turn brown. Add the green chilies, turmeric, red chili powder and cumin. Cook for about a minute. Add the kheema and the potatoes. Mix well to coat the meat. Add the tomato puree…I use little of this, since I don’t want the stuffing to be too watery or tomatoey ….uh, is that a word? Cook covered, on medium heat for 15-20 minutes. Cut the peppers in half and remove the tops, seeds and membranes. Wash ’em and pat ’em dry. Spoon the stuffing in and add grated cheddar on top. Brush the stuffed pepper with a little butter. Place on a baking dish lined with parchment paper, pop it in the oven and bake at 350° for 30-40 minutes. The peppers come out soft, perfectly cook with a slight crunch to them. That looks super yummy. Could you please please please make a recipe for naan or some Indian bread? I’m going to try making this, some curry and bread for a full Indian meal. Thanks Amanda…I’ll be coming up with a naan recipe soon. Patty: Thanks and no problems there really! The recipe looks awesome, I will try it tonight. I have already bookmarked your blog and it is inspiring me to write a blog with my recipes.